Life after second kid, is so hectic!!! Recently read an article Stop the lies about parenting, loved it totally. Please don't mistake me, when i say this, i love my kids, totally adore them, but my life which once was mine, is now totally dependent on my kids. Me going out, is only when i have to take kuttu for his arabic class or for his skate class. Weekend outing depends on how my hubby's mood is after his office. uff, totally hate this, but no other option i m stuck until bala starts school, so i atleast get some time for myself. 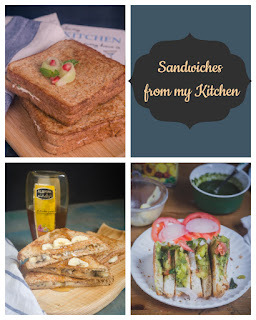 Now enough with my rant, coming to today's recipe, i have this post ready with the recipe and pictures for the past 3 days, but,wasn't getting time to sit and write an intro. 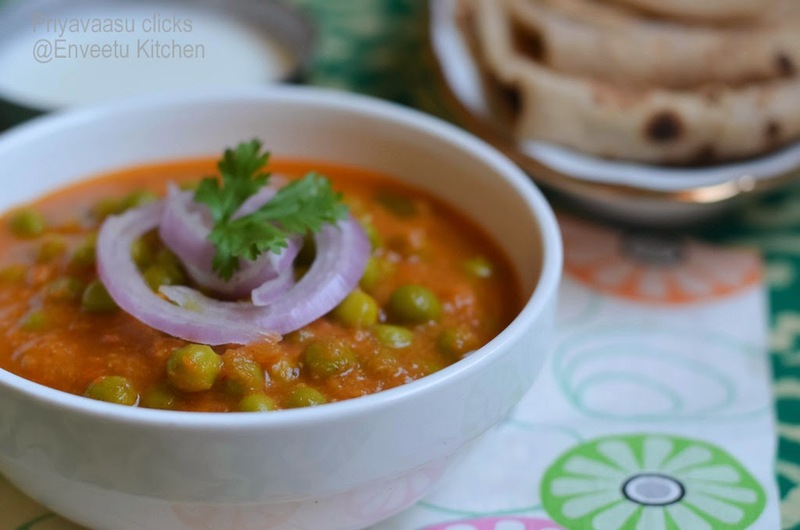 Peas Masala, though i have added peas to my curries along with other veggies, but never tried them as the main ingredient in a side, was in an assumption that it might be too sweet! But, then i was wrong, when you add the right masala's, they taste awesome with roti's are even with rice. I served it for us with roti's and with rice for the kiddo's. Chop onion and tomatoes accordingly. In a pan, add a tbsp of oil, crackle cumin seeds, add chopped onions, slited green chili, chopped garlic and shredded ginger. Saute until onion turn tanslucent. Add chopped tomatoes to this, add 1/4 cup water and almonds. Cook until tomatoes turn mushy. Take it off the stove, let it cool for 10 minutes. Using a hand blender, blend the contents until smooth. If you do not have a hand blender, use your regular blender. Since the contents might be hot, take care while blending. 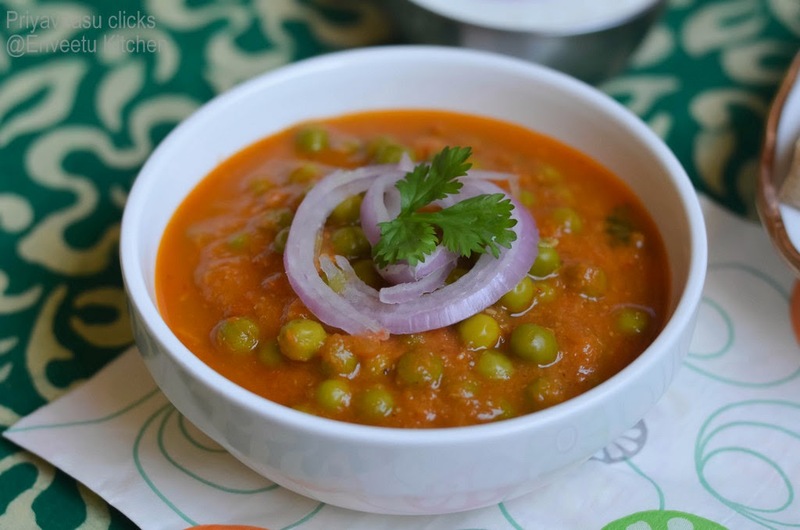 After blending, take it back to stove, add the dry masala one by one and add 1/2 cup water and cook until the rawness escapes and oil separates. Add frozen/fresh peas to this and mix well.Cover and cook in a simmer flame, until the flavors mingle well. Since i used frozen peas, the water was enough, incase you are using fresh peas, add 1/4 cup of water to the gravy. Let the gravy simmer for 10-12 minutes after adding peas. 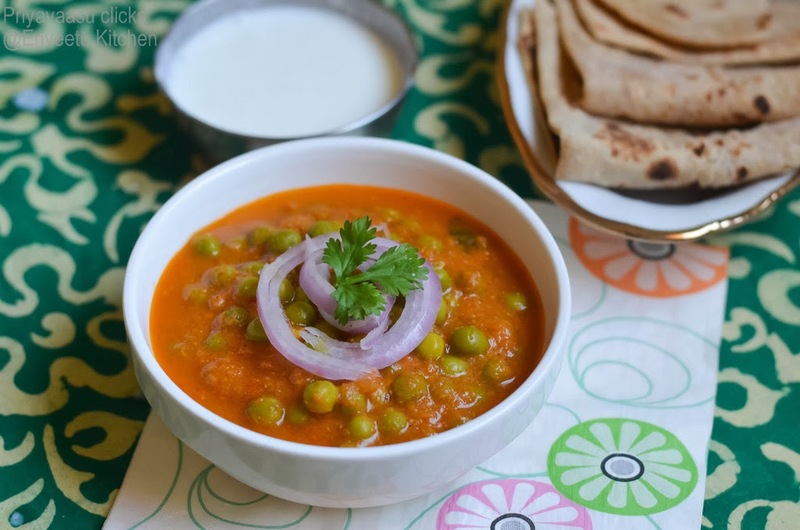 The gravy shouldn't be thin or too thick, once it reaches the right consistency, take it off the stove, garnish with fresh corinader and serve hot with Roti's. 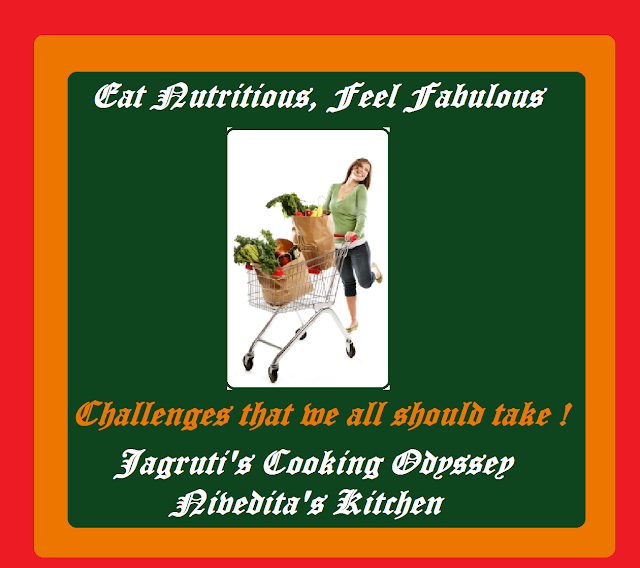 If you are a regular reader of my blog, you will know how i m, for healthy breakfast. 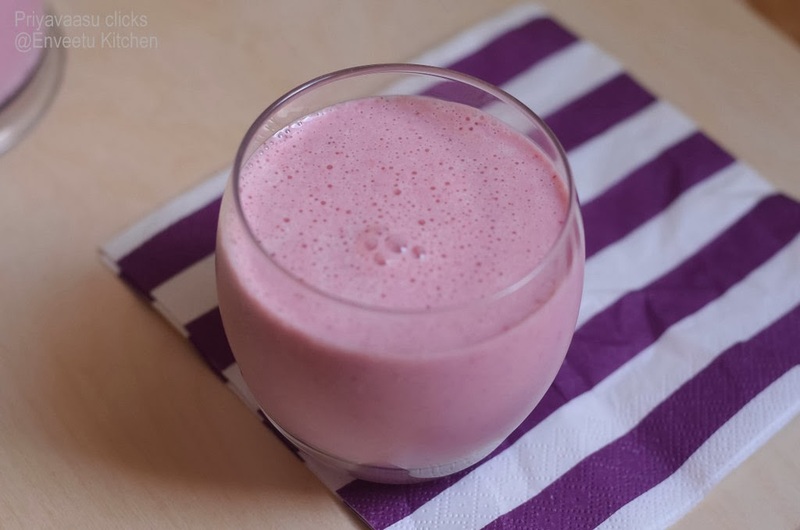 This is yet another smoothie recipe to make your morning meal quick, interesting and healthy. I always have a packet of frozen berries in my freezer, to whip up a smoothie, incase i dont have time to make an elaborate one. I m not for cereal from box for breakfast, somehow, it doesn't fit my list. This smoothie is what i had for my weekend breakfast and today while making i added a heaped tsp of flax-seed meal. Adding flaxseed meal, not only improves the healthy factor, but also keeps you full for longer time. The addition of banana adds a little extra volume to the smoothie, so it makes two glasses as shown in the picture. 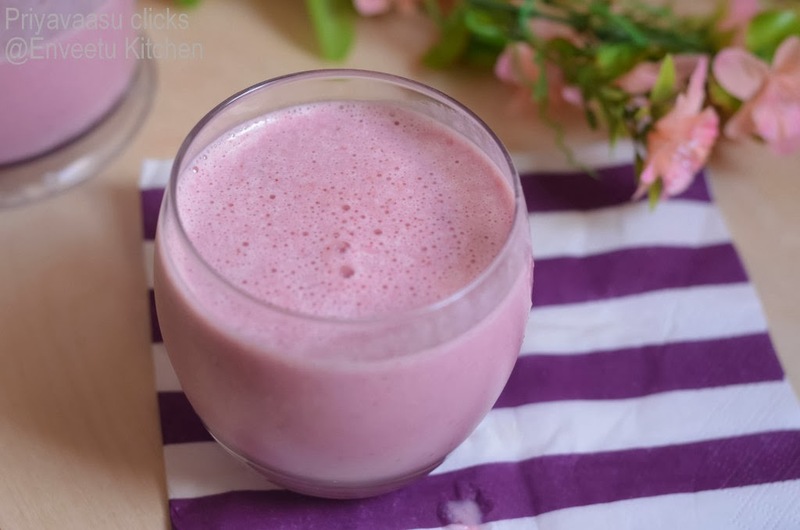 Increase the strawberries to 2 cups to get a pinky pink smoothie, if your kiddo loves the color in, Since, i was making it for myself, i just used 1 cup. Try adding flax-seed meal/ Oatmeal for a filling smoothie or 4-5 nos almonds or walnuts to add a nutty crunchy. 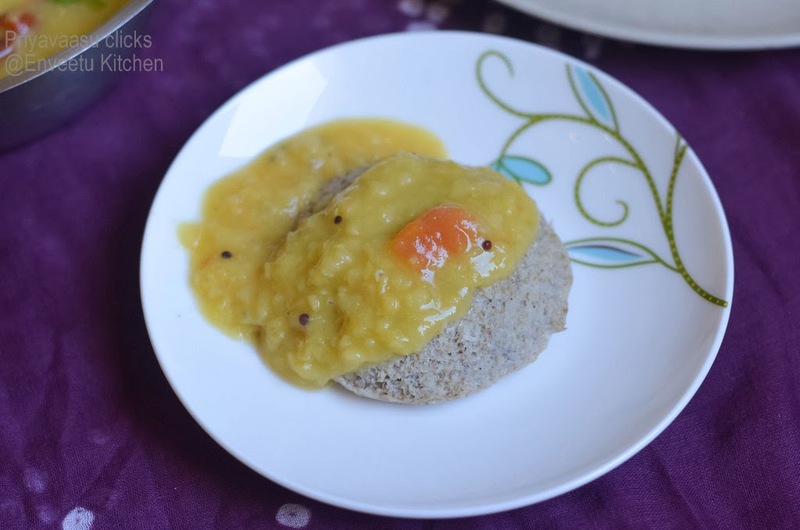 Another experiment for a rice-free idly. 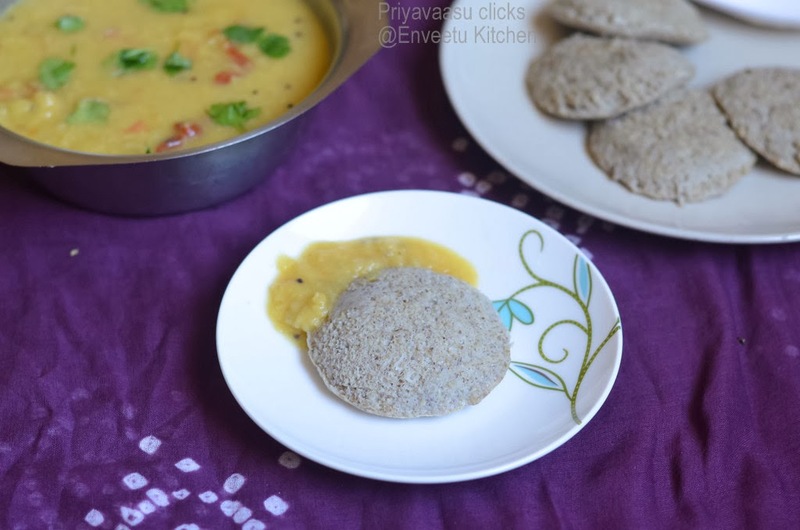 I came across this recipe in a Cookery show, using normal moong dal. 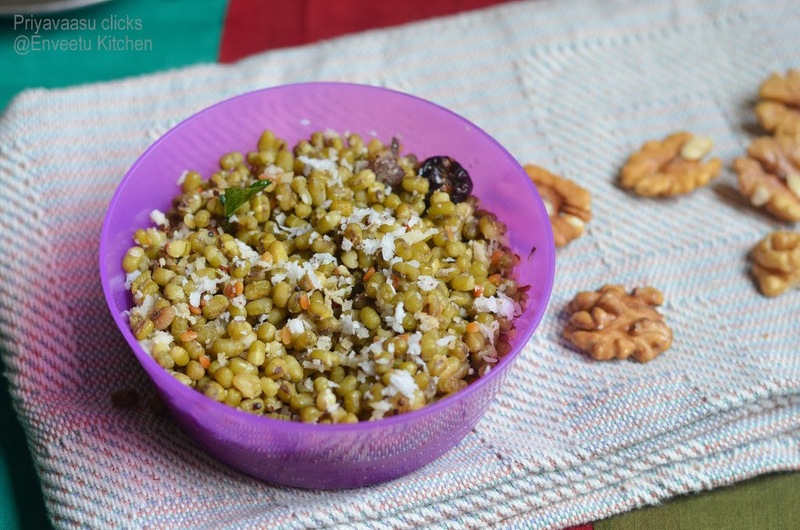 I planned to make it for this week's Cooking from a Cookbook Challenge with a slight change, intead of plain moong, i have used sabut masoor/whole green gram dal. Idlies came out good, though a bit dense, but wasn't heavy. 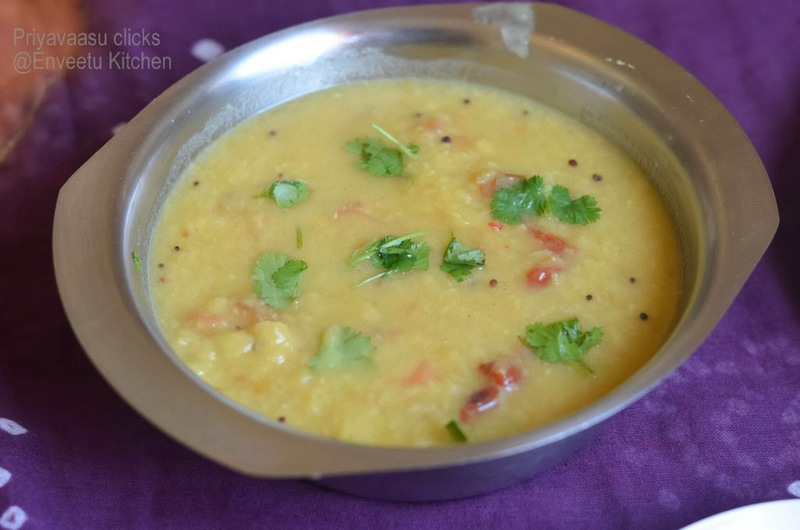 I paired it with masoor dal sambhar for today's breakfast. 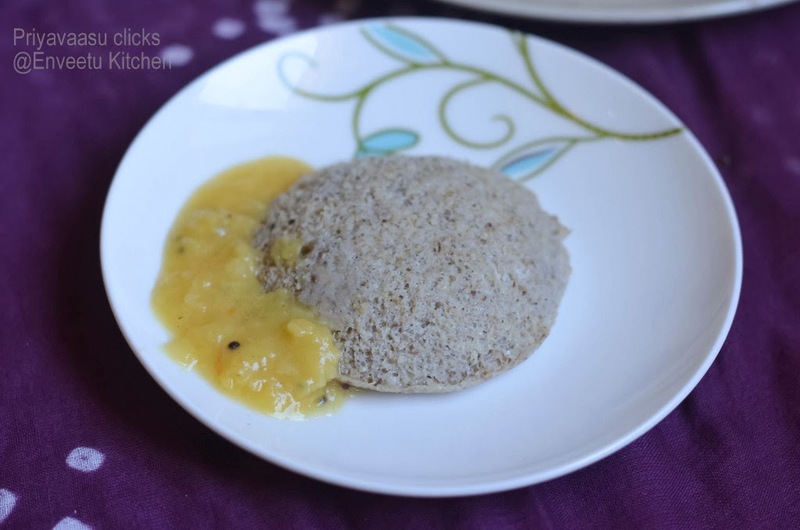 Hubby called to say, he preferred this idly to the normal rice idly. He is my worst critic, if at all, i have learned to cook better, i owe it to him. So, a comment like this from him, that too soon after finishing the breakfast from office, is like getting crowned! Go ahead, try it and for a healthy start of the day. 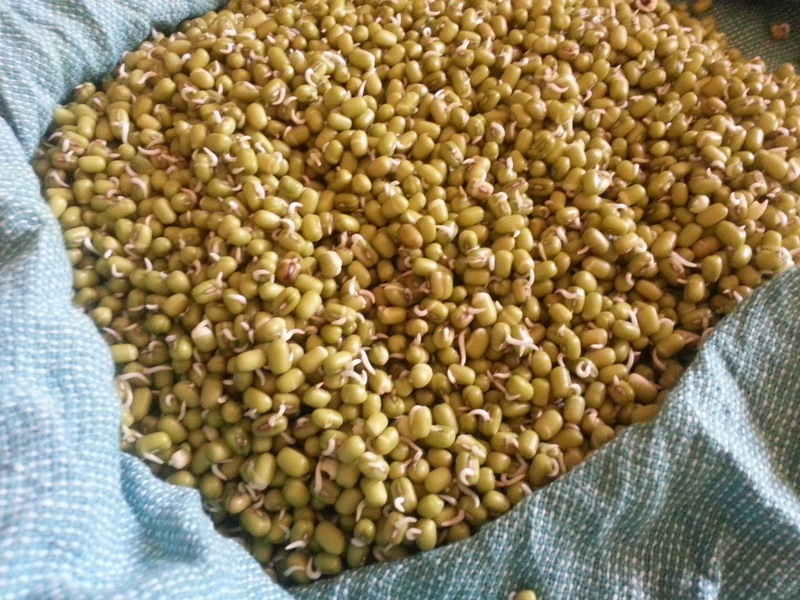 Wash and Soak Green Moong and urad dal in enough water, separately for 3 hours. 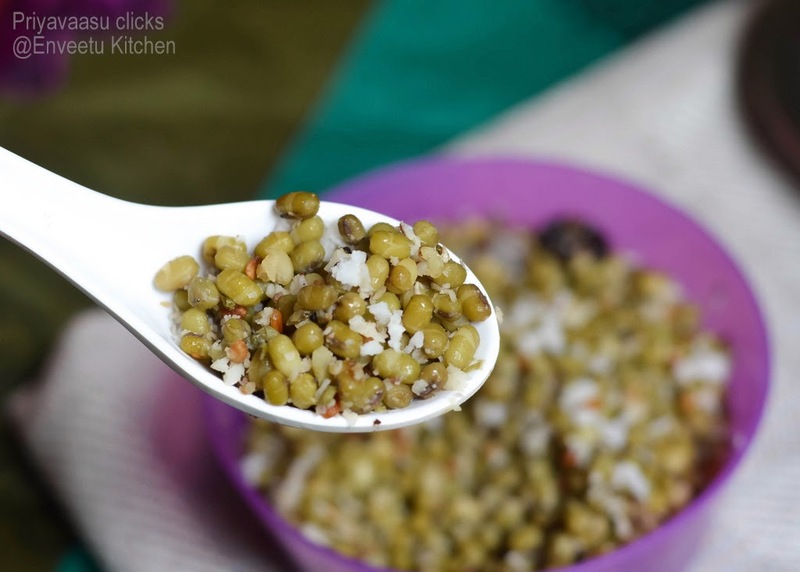 Soak methi seeds along with urad dal. After the required time, drain the excess water from both the dals. 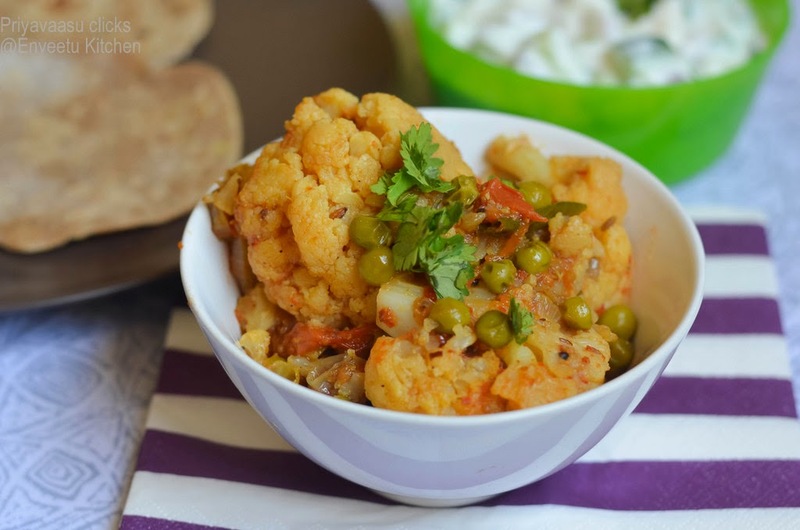 Take urad dal in a mixer and grind it to smooth batter adding 1/4 Cup of water. Transfer it to another vessel. 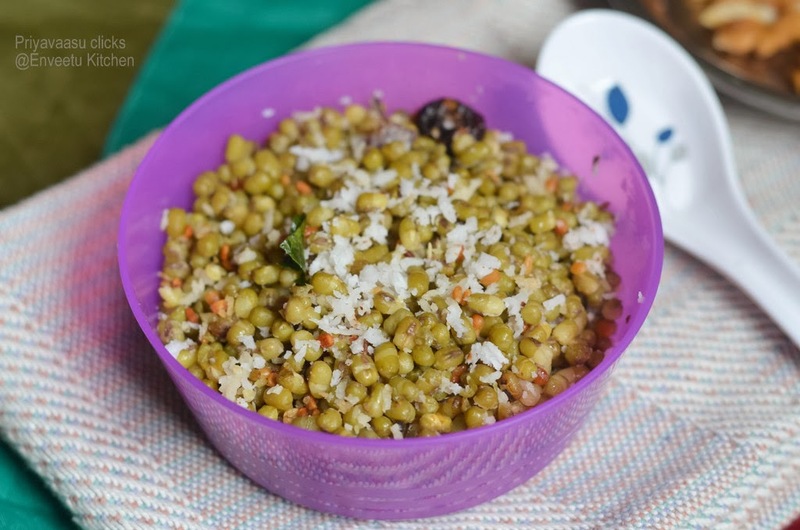 Now take green moong and grind it to a smooth batter adding around 1/4 - 1/2 Cup of water. Transfer the batter into urad dal batter container. Mix both the batter well. Let this sit on the Kitchen counter for 8-10 hours for fermenting. I left it overnight. If the climate is very cold in your place, try to keep the batter vessel inside your oven with the lights on to help in fermenting. Next day morning, add salt and mix well. Grease the idly moulds with gingely oil/any vegetable oil.Pour a laddle of batter in each mould and steam cook for 10-12 minutes. I used my presser cooker without whistle. The batter will be green in color with all green specks all over, like the pessarattu batter. The idly too when out of the steamer will have a green tinge, but later when it cools, it turns this color. 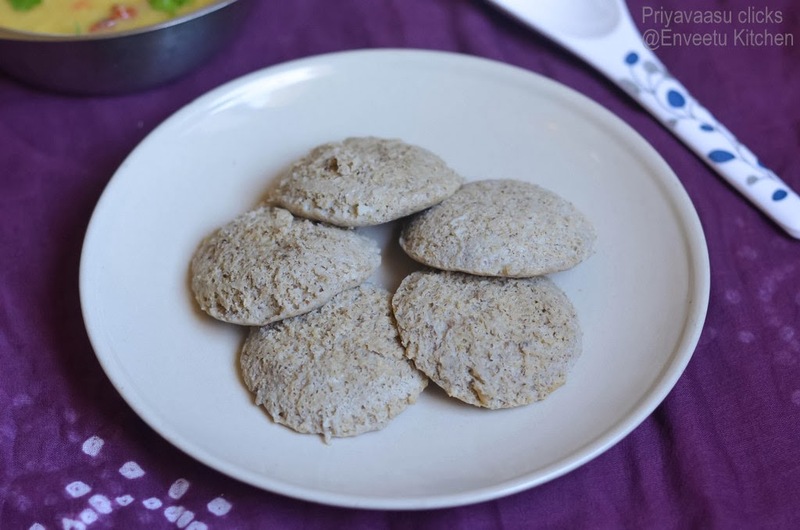 But it taste as good as a normal idly with a pesarattu taste. Weekend Cooking is always a bit elaborate @ my place. I try to make 2/3 curries along with regular rice/roti. For kids it is always rice, but for us, it is either roti/rice, but mostly these days, it is roti. I finally, got my Kenwood Food Processor, started using it and loving every bit. Made chapathi dough using the processor, haven't got the water amount right yet, but then the dough comes out super soft in minutes and the roti's are also soft and fluff up well. So, now i make dough almost for a week and refrigerate it. This makes my weekday lunch packing also easy, i just have to think about the side-dish. With fresh cauliflower and broccoli everywhere, i use them quite a lot in my kitchen. Kuttu loves deep-fried gobi/broccoli, the little one, likes to much on, plain boiled ones. 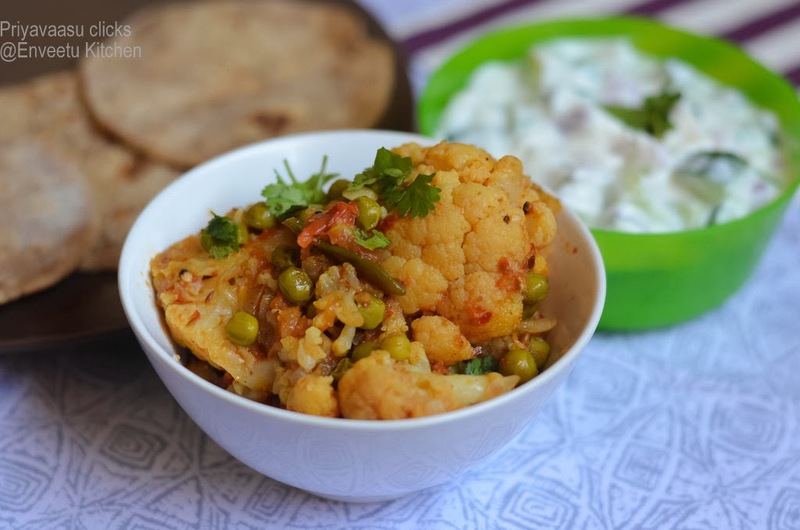 For this weekend, I made this Gobi Matar, turned out finger-licking good. 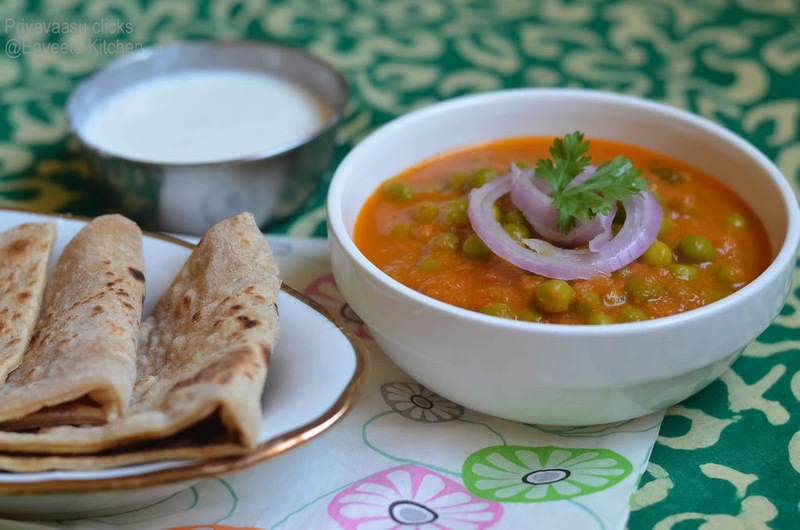 Hubby paired it with roti's, while i had them as such as a meal, it was that good. Quick to make, if you have all the ingredients at hand. 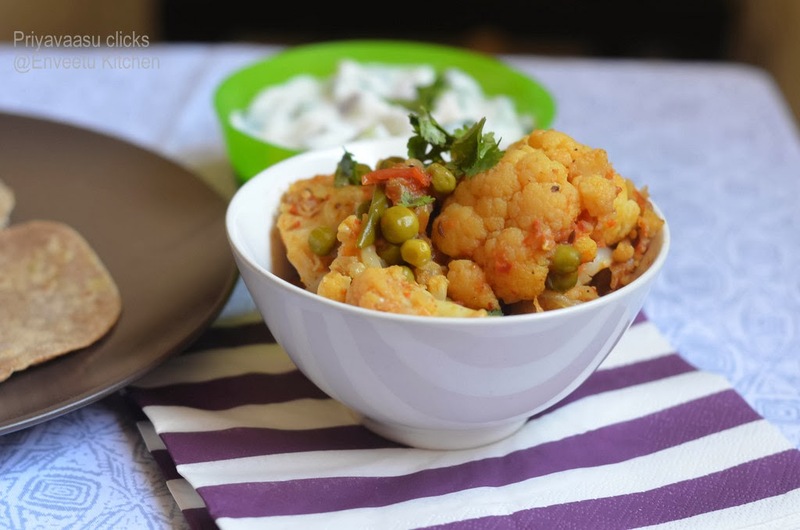 2.5 Cups of cauliflower florets (Big-sized florets) / 1 Big Cauliflower as such. Cut and clean the cauliflower florets for any visible dirt/worms. Soak them in bowl full of salt water. This helps the worms, if any, to get out and float in the water. Drain from salt water and Soak them in Hot water for 5-8 minutes. Drain and keep aside. Both the times, the water should immerse the florets. Chop Onion and tomatoes, garlic and chili as given. Heat a wide-bottom pan, add 2 tsp oil. When it is hot enough, add chopped onion, garlic, ginger and saute until onions turn translucent. Next add chopped tomatoes and all the dry masala powder (Red chili powder, coriander powder, garam masala powder and turmeric powder). Add 1/4 Cup of water. Let the tomatoes cook until soft and mushy. 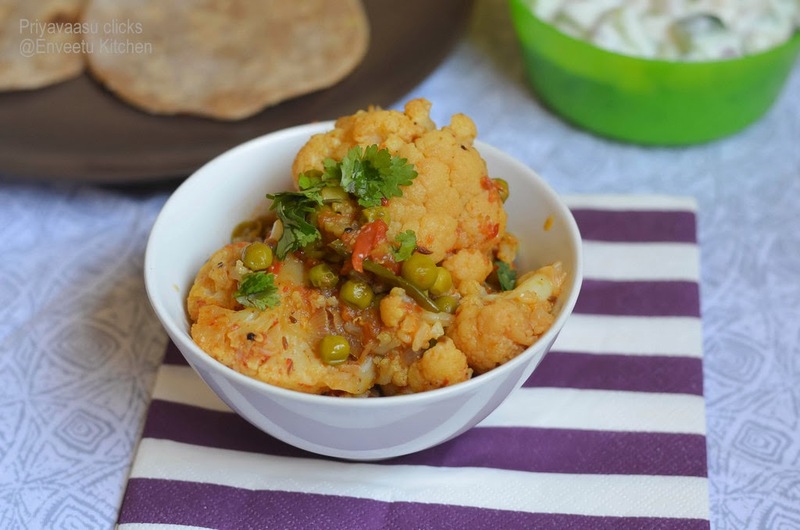 Now add Cauliflower florets and peas and another 1/2 Cup of water. Add salt and mix well. Cover and Cook for 10 minutes in a medium flame, for the flavors to mingle well. By this time, the curry should be almost dry, if not, cook for 4-5 minutes extra. When it is almost dry, take it off the stove, garnish with fresh coriander leaves and serve along Roti/rice. I served it with roti and cucumber-onion raita. I stumbled upon this while Gawking @ Foodgawker. 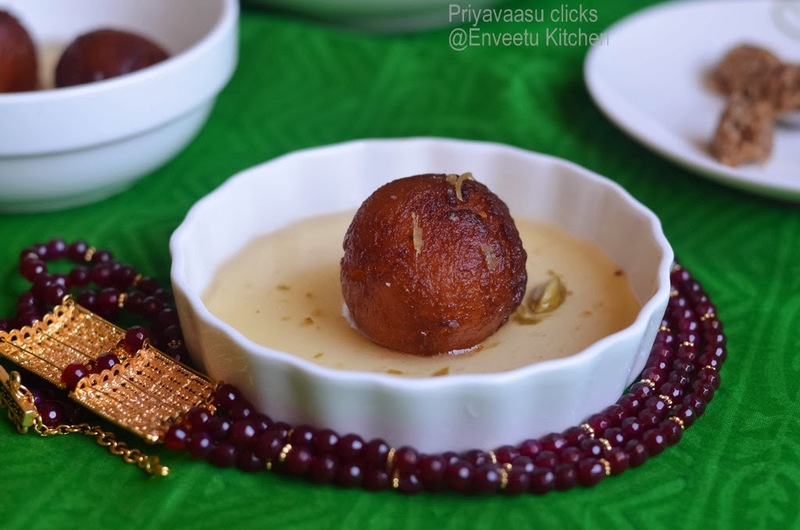 Wow, gulkand stuffd soft n juicy gulab jamuns, cried exotic! Loved the way the author @ Kiran Tarun, Ms. Kiran described those jamuns. Luckily, i had a small dabba of gulkand, which i bought from india @ Nuts n Spices, chennai. So, i immediately, bought a pack of gulab jamun mix, but the time was't ripe enough for it come it into action, until last month. Finally, after lots of pleas and threats from my hubby, i made them last month. It was worth all that wait and it was divine biting into those juicy jamuns. Give it a try, you won't regret it. 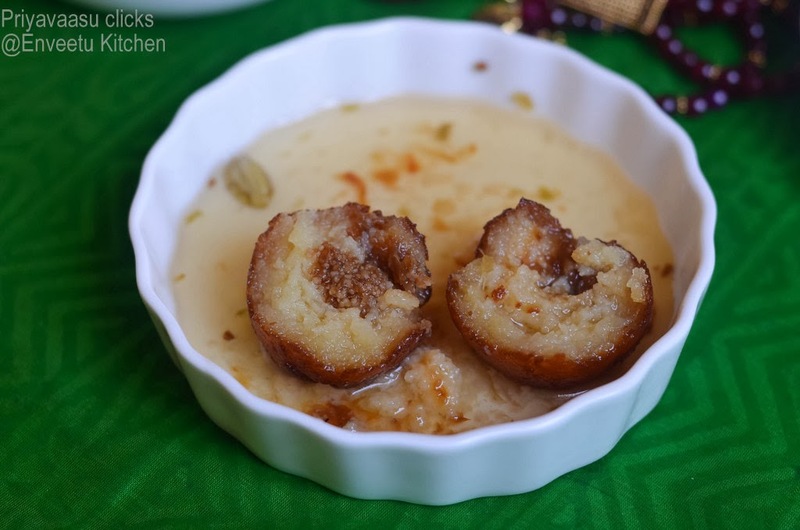 A perfect dessert for parties, adult parties, i won't recommend it for kids, though my lil fella loved the non-gulqand jamuns, he made faces while tasting the stuffed ones. Oil for deep frying the jamuns. 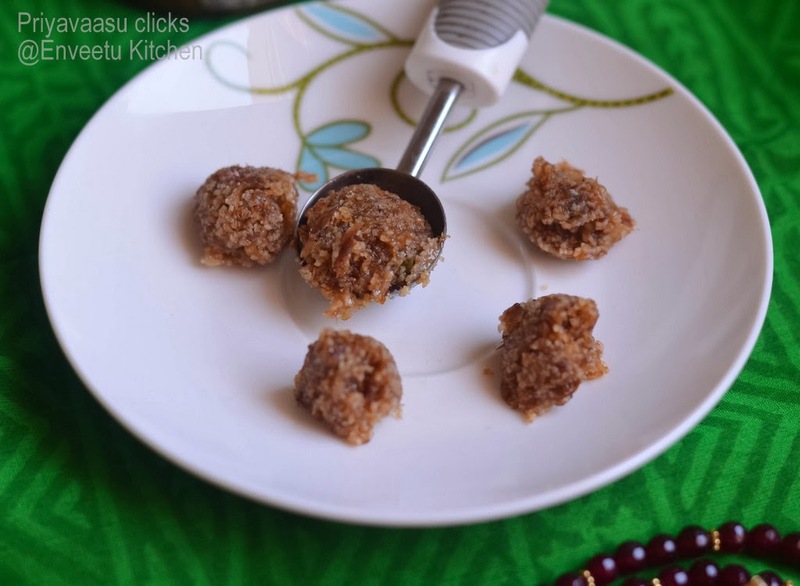 Make pea-size balls of gulqand/gulkand/rose petal preserve and freeze it. This is important or else the gulqand might ooze out and will mix with dough. So, two hours before making the jamuns, freeze the gulkand/gulqand. The number of gulqand/gulkand balls depends on how many jamuns you are going to make. I made around 30 gulqand jamuns and 30 normal jamuns, so i made 30 pea-sized balls of gulqand/gulkand and freezed. 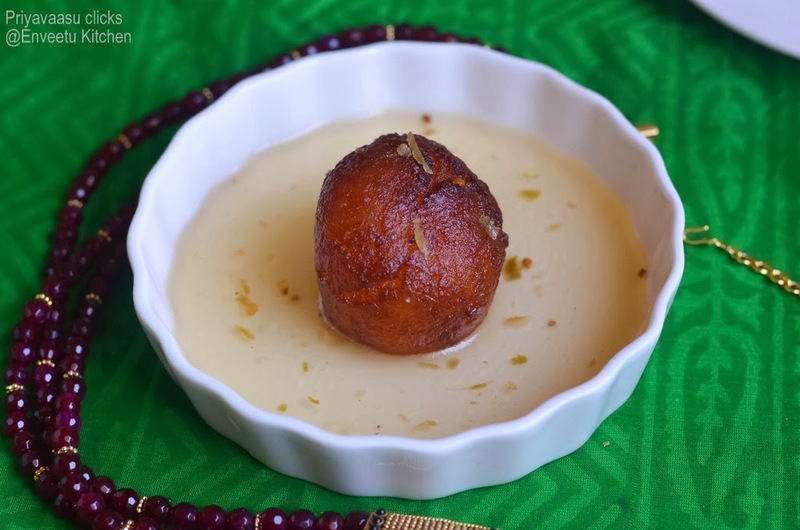 Make the gulab jamun dough, according to the package instructions. 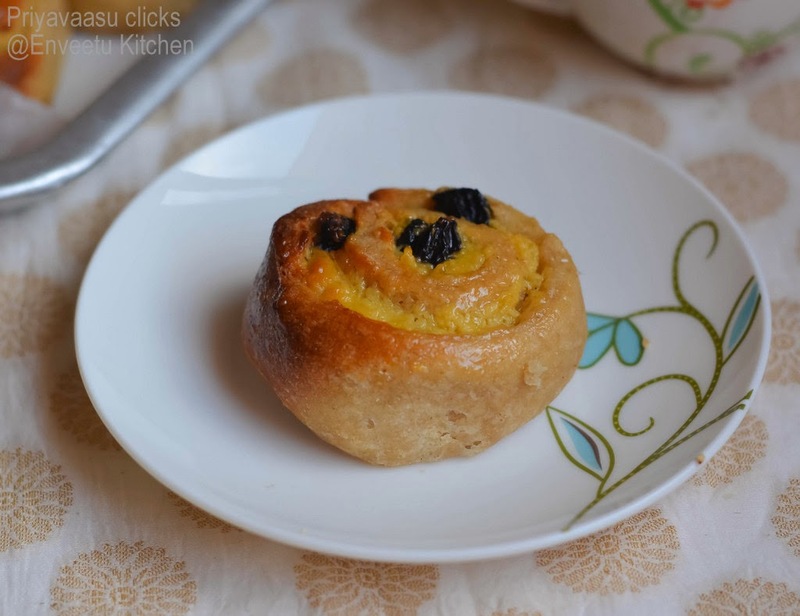 I used milk to make the dough instead of water, this gives a rich taste and texture to the jamuns. Now, the pack which i used said, it can give 100 jamuns, so with the stuffing inside, i need to make the jamuns a bit bigger, so i got around 60 jamuns. 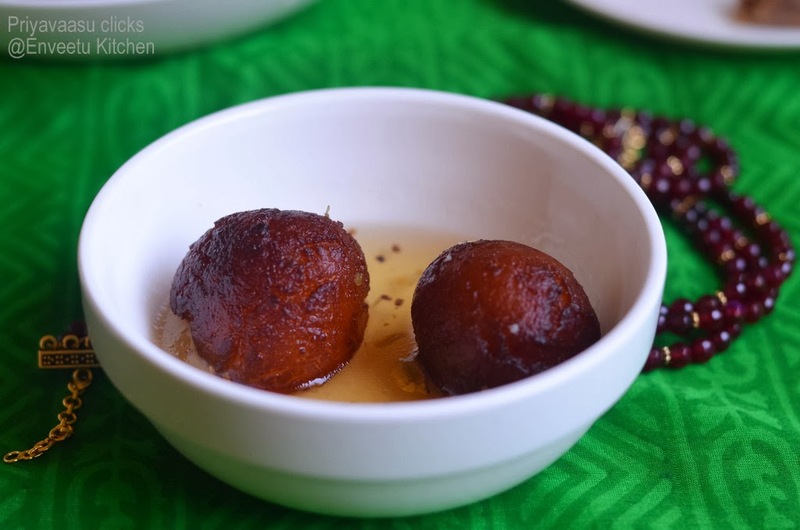 Start making jamun balls, while making balls, stuff a the gulkand ball inside and shape it into a ball. Repeat the same for all the gulqand/gulkand balls. Let the balls rest for 10 minutes. While the balls are resting, make the sugar syrup, take the sugar in a heavy bottom pan, add water and boil. When all the sugar dissolves, add cardamom powder and switch it off. 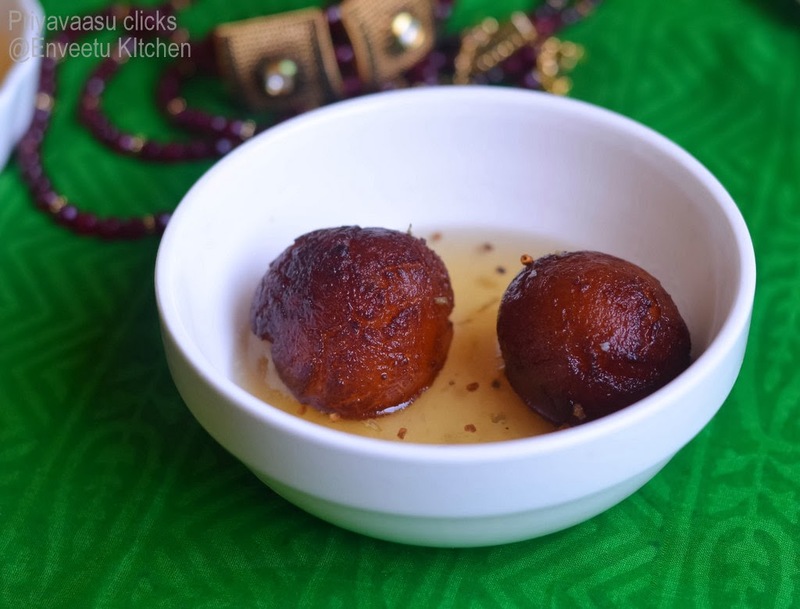 Heat oil in a wide pan, when it is hot enough, add the jamun balls and deep fry them in batches. 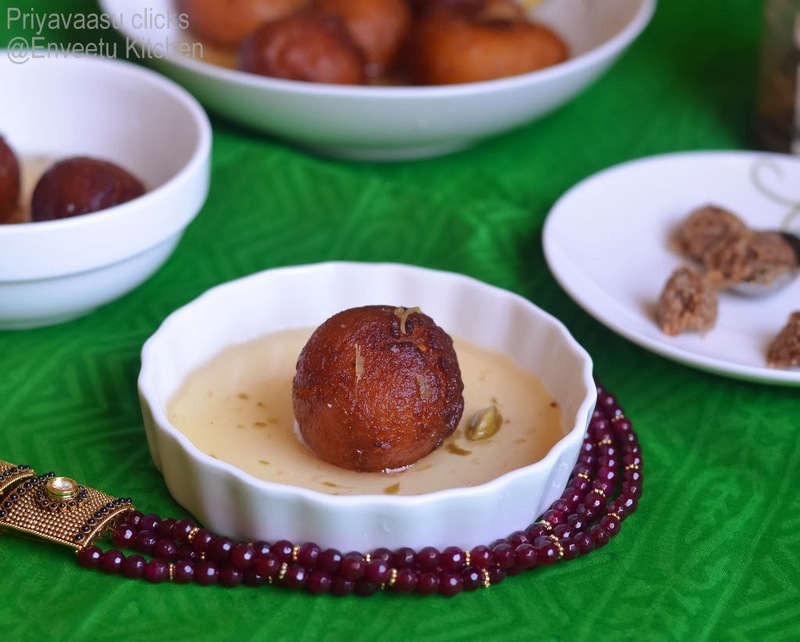 Do not crowd the pan while frying the jamuns. Do not touch the jamuns with the laddle. Just wobble the laddle in the oil, so that the oil touches the jamun. Keep the flame low while frying the jamuns, or else you will end up with brown, uncooked jamuns. Once they have browned well, remove from oil using a slotted spoon and drop them gently in the sugar syrup. Continue this for all the jamuns. Let it sit for atleast 2 hours for the jamuns to soak well and take all the flavor. Serve Warm or Chill and enjoy. We personally prefered the jamuns next day after it had soaked up all the sugar and the flavor of gulkand/gulqand infused well with the jamuns. I packed some to my hubby's office the next day, it was well received and appreciated. Sending this to Let's Cook Sweet Treats for Valentine's Event, happening @ +Nayna Kanabar Space. When both the kids are at home, they want to eat something interesting, away from the usual stuff. Kuttu started pestering me to bake a chocolate cake, because it is long time, since i baked one. So, i made this Microwave Chocolate Cake for him. Both of them enjoyed it to the core, i baked only 2 small bowls, both had one bowl each and i had to bake one more for their Dad, when he came in the evening. It was very moist, fluffy and too good for a microwave cake. Sieve the flour, cocoa, baking soda together in a large bowl. In another, mix together curd, sugar, oil and vanilla essence. Add the wet ingredients to the dry ingredients, add water and whisk well to combine.The batter must be smooth and of dropping consistency. Pour the batter in 2 greased, microwave safe bowls. Fill only 1/2 the cup, coz the batter will rise well to fill the cup. Microwave on high for 2 minutes and 30 seconds. Check the cake with a tooth-pick, if it comes out clean then it is done. Remove from the microwave, cool slightly and unmould. 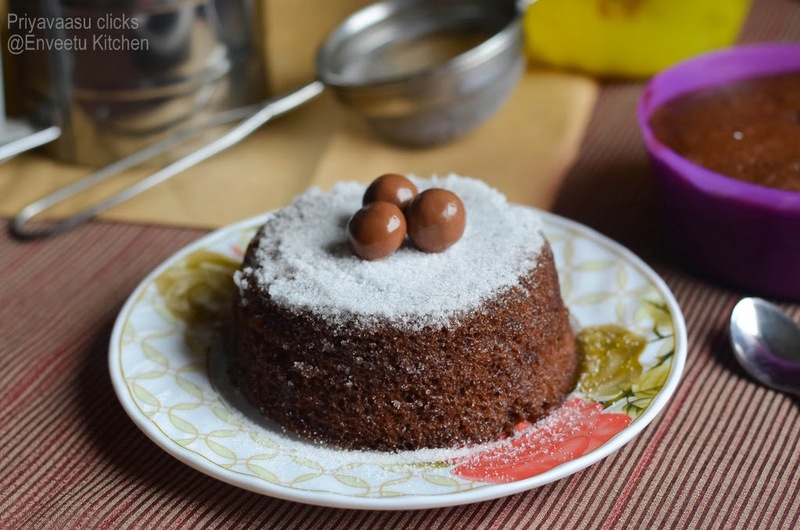 Dust with castor sugar and decorate with some maltesers. Serve warm. The cake stayed soft even after refrigerating. If serving from the refrigerator, warm it for 20 seconds in a microwave and serve. Microwave settings vary from Oven to Oven, so bake accordingly. In the Original recipe, it was baked as a single cake in a 7" cake pan, so it took 4 minutes for the whole cake to bake.Since, I have made it in 2 separate bowls, it took only 2 minutes and 30 seconds. I would suggest you to bake for 2 minutes first, check the cake with a tooth-pick, if it comes out clean then take it out of the oven or else bake for another 30 seconds more. Another method to check the doneness is to touch the cake top, it should spring back. Do not bake the cake for more time, or else it would become too dry. Sending this to Lets cook sweet treats for valentine, happening @ +Nayna Kanabar's space. 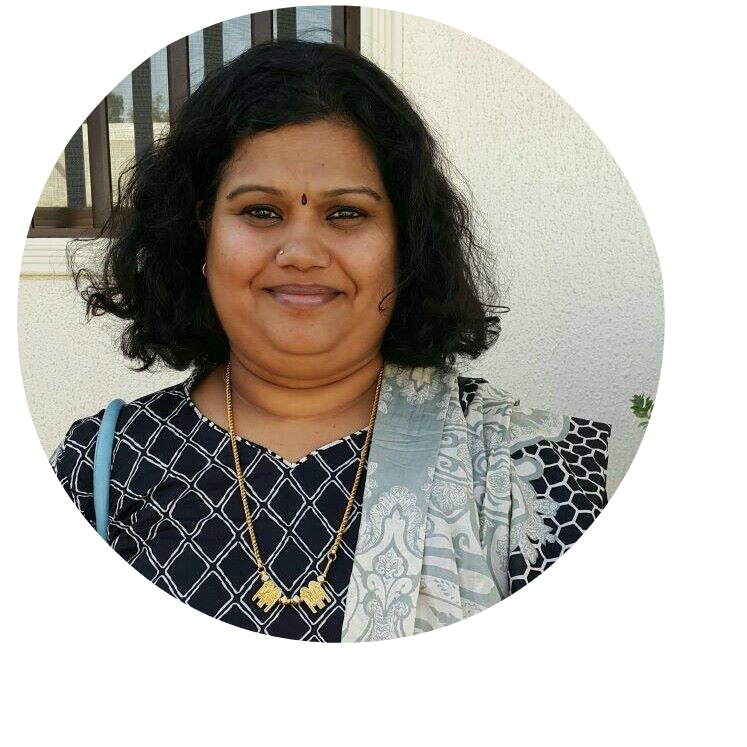 And also to Fabulous Feast Friday, happening @ +Sandhya Ramakrishnan's space, an event by +Chef Mireille . 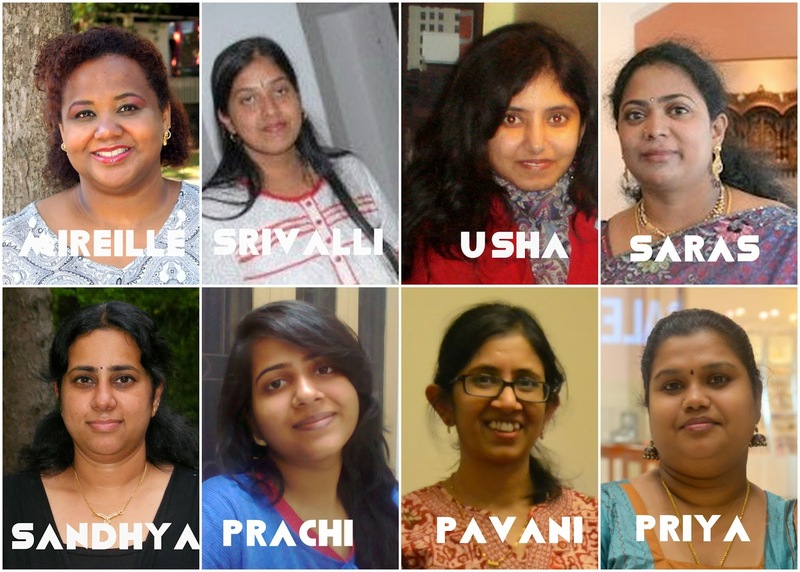 The Baking Eggless group has completed two years and is entering the third successful year. 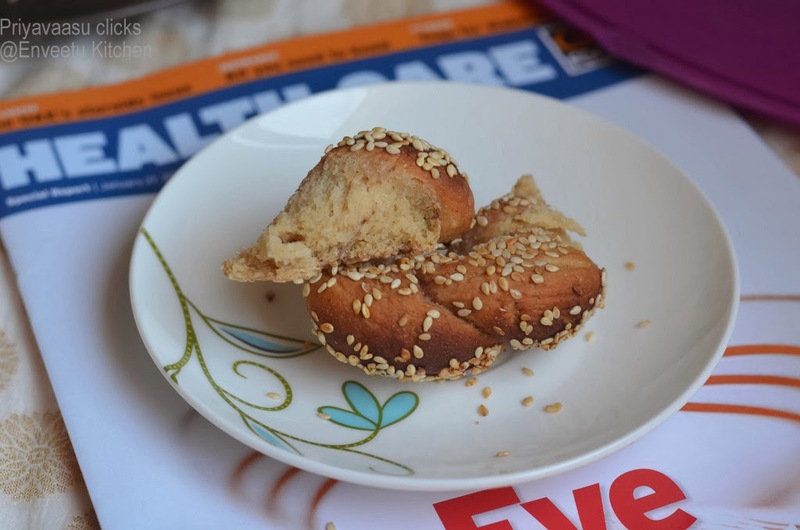 I have managed to bake most of the challenges, but i m particularly crazy for breads, this month challenge was to bake Greek Simit, Crunchy sesame seeds coated twisted bread, suggested by +Priya Suresh. 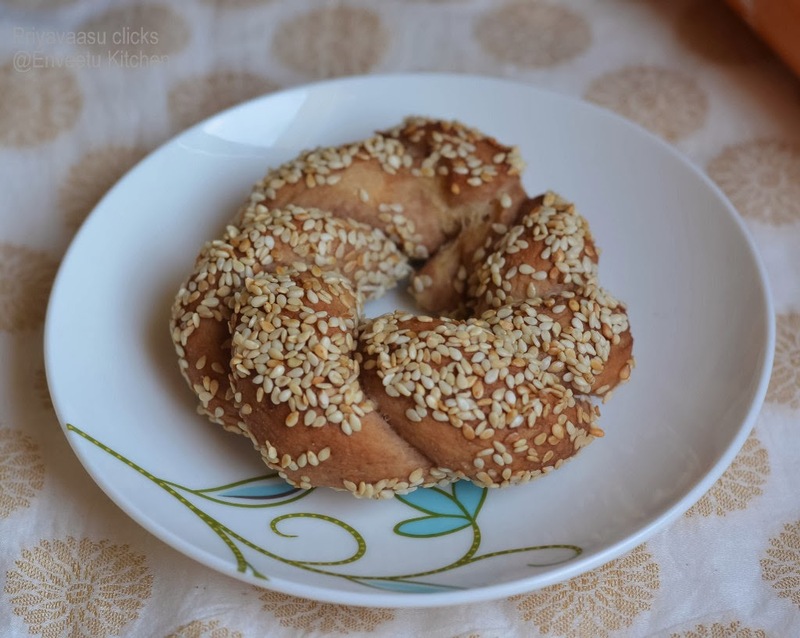 A Little more info on Simit, It is a circular bread with sesame seeds, very common in Greece, Turkey, as well as in Serbia, Bulgaria, Macedonia and other parts of the Balkans and Middle East such as Egypt and Lebanon. Drinking Turkish tea with simit is traditional in Turkish culture. Simit is generally served plain, or for breakfast with tea, fruit preserves, or cheese. 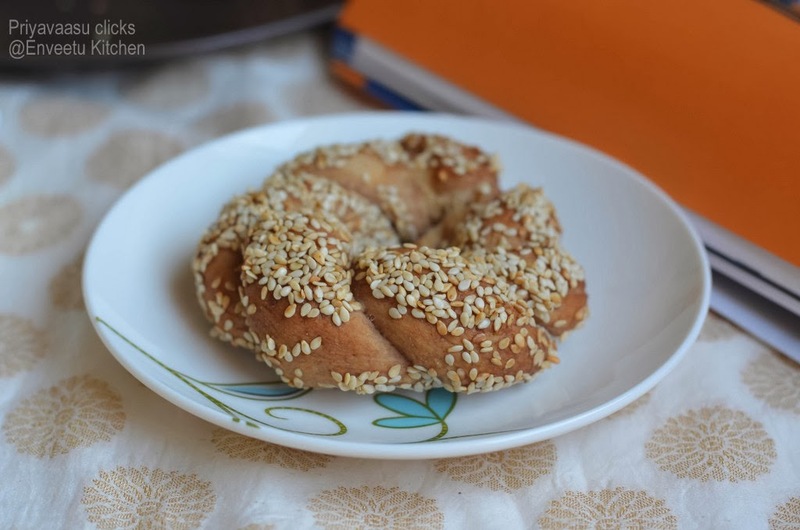 Simit's size, crunchiness/chewiness, and other characteristics vary slightly by region. In the city of İzmir, simit is known as "gevrek," although it is very similar to the Istanbul variety. Simits in Ankara, which is the capital of Turkey, are smaller and crisper than the ones in other cities. 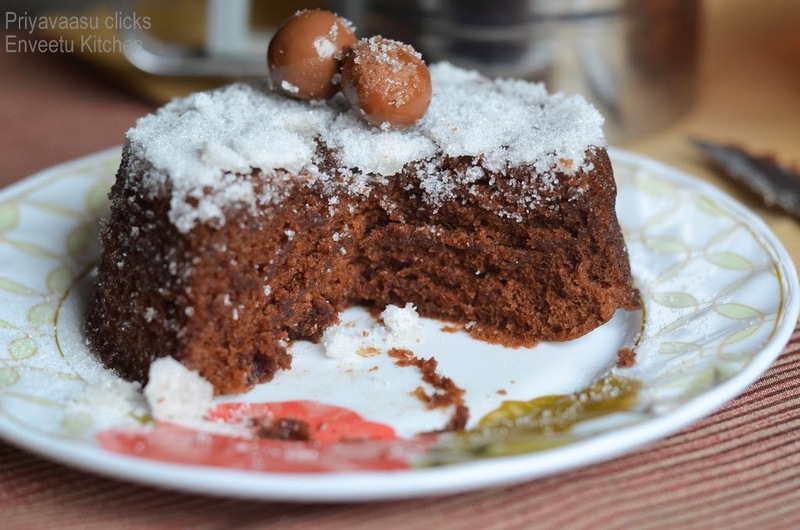 Simits in Turkey are made with molasses. Simits are often sold by street vendors, who either have a simit trolley or carry the simit in a tray on their head. Street merchants generally advertise simit as fresh ("Taze simit! "/"Taze gevrek!") since they are baked throughout the day; otherwise hot (when they are not long out of the oven. Take the Juice in heavy bottom pan and heat in a simmer flame. Let this be simmering until it reaches 1/4 of its original volume. Take it off the heat. Let it cool compleltely. Store in an air-tight container in the fridge. In a large bowl, mix together flour, salt, sugar, yeast and oil. Mix together milk and water and add it to the flour mix, to make a soft and slightly sticky dough. Take the dough to the counter and knead for 10 minutes until soft and elastic.Place the kneaded dough inside an oiled bowl, cover with cling wrap and allow it to double for 1 hour. 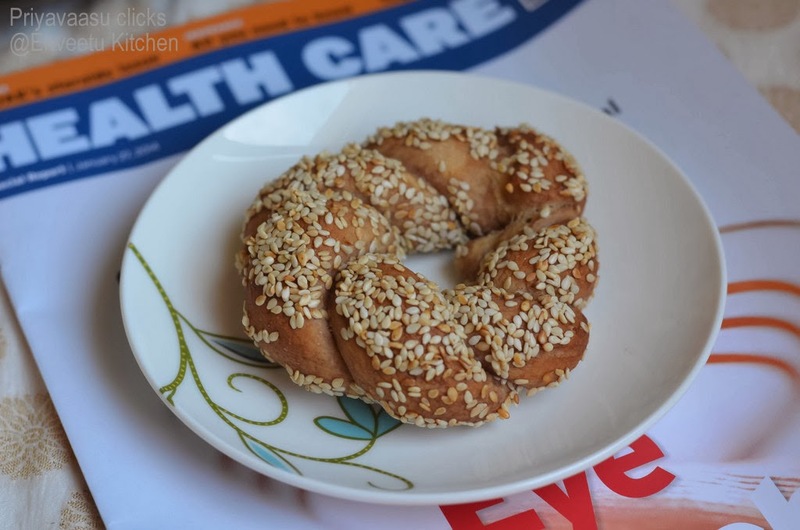 While the dough is resting, roast the sesame seeds.Take them in a flat pan and roast until slightly brown and aromatic. Remove and cool. In a bowl mix together grape molasses and water.Deflate the dough and divide into 5 equal portions. Divide each portion into two and roll each portion into a 60 cm long rope. bring together and twist to form a braid. Bring together the ends and seal to form a braided ring. Dip the ring in grape molasses and place it on the sesame seeds. Coat the ring completely with the seeds. Place the coated ring on a baking tray. Complete all the rings.Since i made only 5 Simitis, i baked them all in one single batch. Let the Simitis sit for another 30 minutes. Bake for 20-25 minutes until nicely browned. Remove from oven and serve it hot or warm. Just slather it with little butter or cheese and enjoy warm. Since i have used whole wheat flour, i needed around 1 and 1/4 cup of liquid to make the dough. In case using All Purpose flour, you might need less liquid to make the dough. So use accordingly, i would advice you to start with 3/4 cup of milk first and then add extra, if needed. For this month’ Baking Partners Challenge, we are baking from Netherlands. 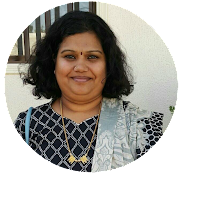 koffiebroodjes/ Dutch coffee buns and Dutch apple pie are recipes suggested by Kaveri of Palakad chamyal. These buns are usually served with coffee, so it is called coffee buns. 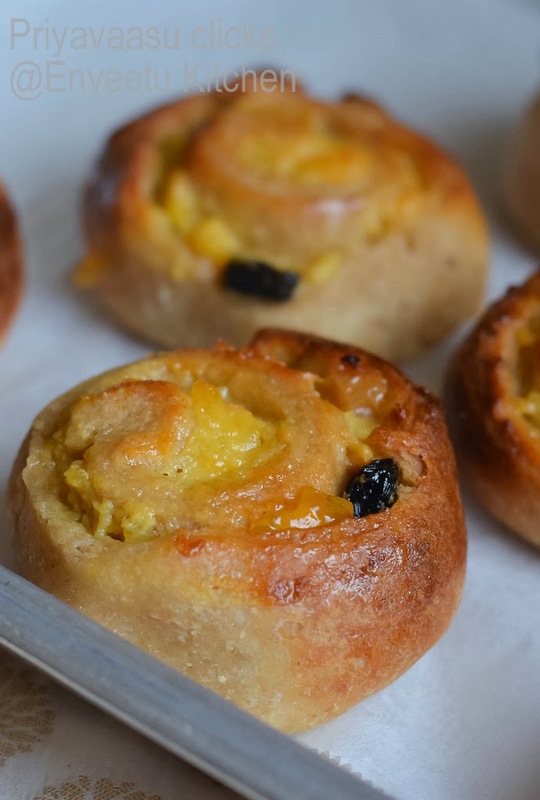 Koffiebroodjes are sweet pastry rolls filled with pastry cream and glazed with apricot jam. Coffee cakes are eaten at breakfast or brunch, and because pastries can be eaten simply as a snack in Netherlands, they are often for sale at street stalls or train stations, along with croissants and other chocolate rolls. They are baked in different shapes and fillings too. 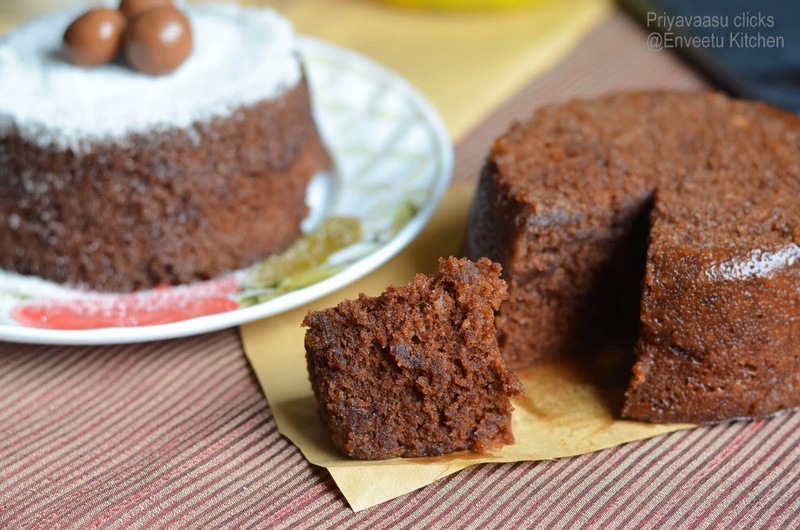 Someties as a square cake with cream/custard filling, sometimes oblong shaped with raisins, sometimes with chocolate. 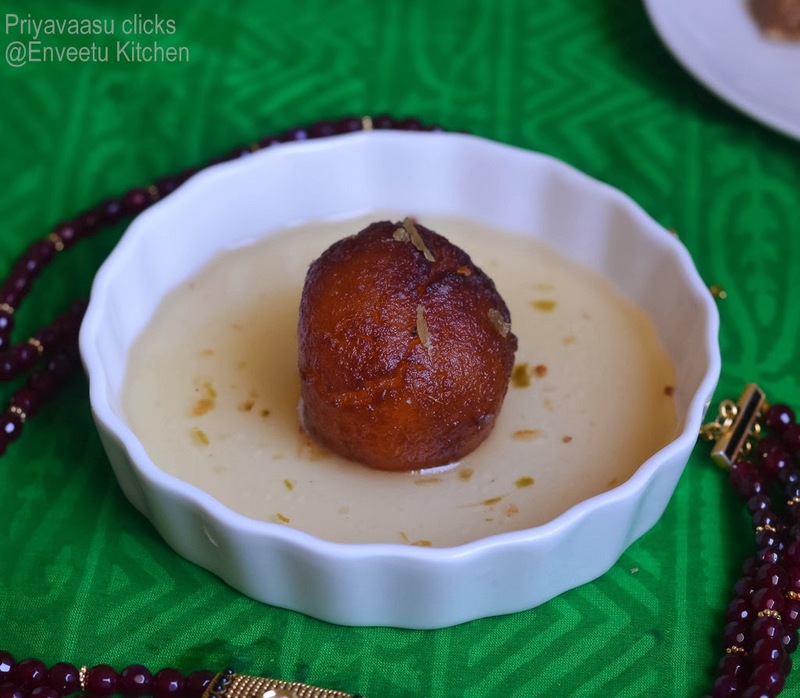 The pastry cream i have used here is an eggless version. 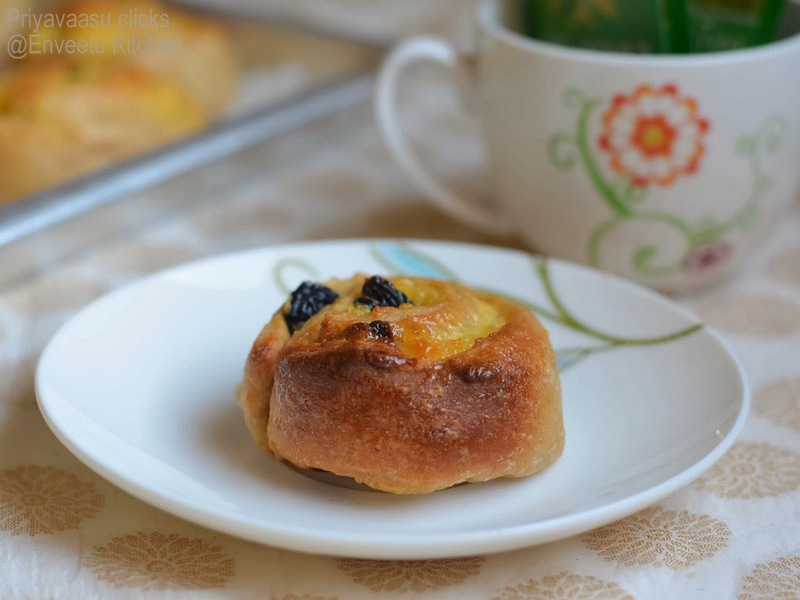 These buns make a great accompaniment during coffee time. It is served warm with another coating of apricot jam glaze. I have halved the original recipe and got 10 rolls. Makes a great party treat or after school snack for kids. Soak the raisins in warm water for 15 minutes. Drain and set aside until use. Heat the milk until warm, not boiling. Add the butter to it. The temperature of the liquid added is very important while making yeast breads. Too hot or too cold will kill the yeast and your dough wouldn't proof well. I check my inserting my finger into the liquid, it should warm and not scalding hot. In case if you are doubtful use a candy thermometer to read the temperature, it should read 110 to 115 degrees. Take Flour, yeast, sugar and salt in a large bowl. Mix well to combine. Now add butter added warm milk to this flour mix.Add vanilla extract and knead to make a soft dough. Let it Sit covered in a warm place in a well oiled bowl for about 90 minutes. The actual recipe suggested only 40 minutes. But it is a bit cold in my place now, so i left it for 90 minutes inside my oven with the lights on. Making the Pastry cream filling. Make the filling immediately after making the dough, it takes time to cool down before using in the buns. Before making the dough, take 1/4 cup of yogurt and keep it in a tea-strainer, for it to drain all the whey. Let it sit this way until use. Heat 3/4 Cup of milk in a pan, add the custard powder to the remaining 1/4 cup of milk and mix well without any lumps. When the pan milk is hot, turn the flame to simmer and add the custard mixed milk to it and stir well to combine without any lumps. Keep stirring, the milk will start to thicken, Keep whisking until the custard becomes very thick. Take the pan off the heat and let the custard cool to room temperature. When it is completely cool, add 2 tbsp of hung yogurt to this custard and whisk well. Keep aside until use. It is important that the custard filling be very thick to avoid mess-free rolls. Prepare a baking tray with parchment.I used my stainless steel plate, fully wrapped with aluminium foil. preheat the oven to 170C/350F. After dough has doubled. Transfer it to well-floured surface. Punch it down and knead for minute. Roll the dough into a (8x8) square of about 1/4 inch thickness. Spread the pudding and raisins, leaving an inch gap on all sides to aid mess-free rolling. Roll the rectangle tightly, like a jelly roll. Cut the rolled dough, using a sharp knife about 1/2 inch thickness slices. Place the cut slices on the baking tray with the cut side facing down. Let it sit for another 30-40 minutes or until it looks puffed up. Brush the top with butter and bake for around 25 minutes. Mine was done in 25 minutes. 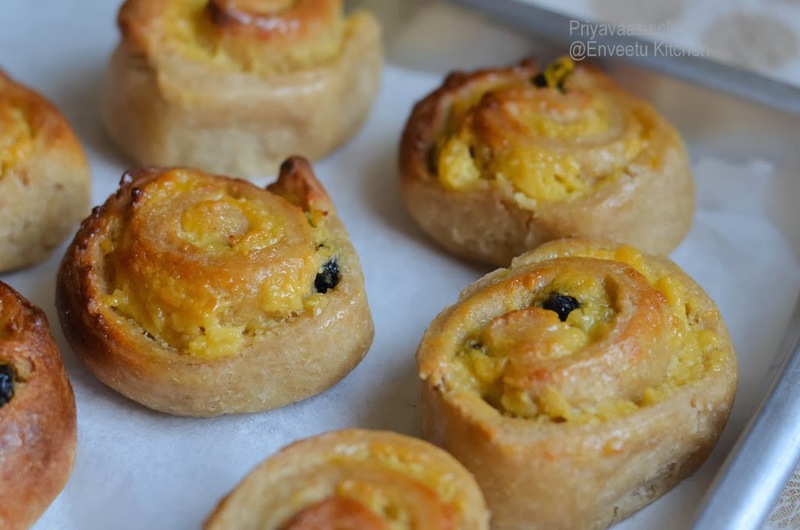 Remove from the oven and brush them immediately with apricot jam and water mixed mixture. Let it cool completely, give them another coat of apricot jam n water mixture. Serve Warm along with coffee or tea. Makes a delicious after-school snack for kids.